It is time for a bit of randomness. 2. This post has one of my all time favorite tree shots....it is the combination of the tree /atmosphere/lighting. 3. 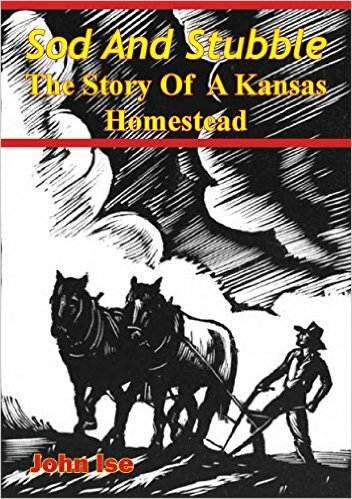 I was a happy camper a couple weeks ago when I found Amazon had finally made Sod & Stubble: The Story of a Kansas Homestead by John Ise available in kindle format. Even though I have a hard copy, I bought it too quick to talk about and have now read it once again. 4. We are thankful for good neighbors. When Roger went to mow the yard last weekend, he discovered a flat. Actually two flats. The back one would not stay inflated. The neighbor saw he was having trouble. He has a tool to take the tires off the rim...so they did that and discovered the tired was separating. We just got all new tires....and Tom helped get the other tires off and the new ones on. We won't go into details about how it would start but not go in gear...or so he thought. Roger left it for that night, but the next morning here came Tom again. That is what you call good neighbors. Hap Shaughnessy reminds me of a few characters I have know. While they frustrated me, he makes me laugh. Nothing beats a good neighbor. Great Post. Absolutely love that tree. We have just our kids as neighbors, but they are wonderful to help if we need them. You are lucky to have good neighbors. Love Simon's Cat, and I will have to check out this new book- thanks for recommending it. Lovely randomness Rose. Glad you have good neighbor's. Crazy guy in that last video, for sure! The cat video makes me smile. It is a blessing to have good neighbours. Have a lovely day! I love Simon and I of course had to order that book for my Kindle. It looks good. We sometimes have similar tastes. Good neighbors are a treasure. Since I am a widow, my neighbors take good care of me. Could not ask for anything better. I enjoy reading too. Sorry about the tires but so thankful your neighbor was so helpful. Thanks for sharing about that book. Simon the Cat always cracks me up. I've not read the book you mentioned. Wow that tree was something. Fun post to view here today. Someone told me once that good fences make for good neighbors! LOL. Just a random thought. Hello Rose, great funnies and randoms. It is great to have wonderful neighbors. Happy Tuesday, enjoy your day!